Homemade Italian Dressing can be made easily in your own kitchen. One thing is for certain once you start making your own homemade Italian Dressing you won’t be purchasing salad dressings anymore. This is your basic recipe for Italian dressing. You may want to experiment with using different flavored nut oils, and different types of vinegars when you make this homemade Italian Dressing. The possibilities really are endless. Homemade Italian Dressing will stay fresh in your refrigerator for up to two weeks. 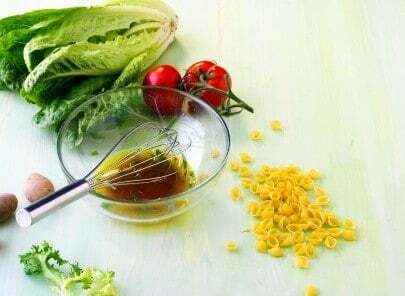 Make easy to prepare homemade Italian Salad dressing at home. It's so good when it is fresh. Mix all ingredients together well. Store in an airtight bottle or jar. Chill several hours before serving. Shake well before serving. Interesting reviews and comments. Have you ever heard of San Francisco seasoning? I used to get it in the 70’s in the Bay Area and it was perfect for coleslaw. Just mayo and SF seasoning was perfect. Alas, it is not sold anymore and I don’t know anyone who can duplicate it. I have made a version of bernsteins restaurant recipe dressing. I think it is pretty close. but it has an ingredient you have to find that is not in your local supermarket. Malted Barley Extract. I found it on amazon. It makes all the difference. What I dont know is where to post it for the world to see properly. Where can I find the recipe for your version of bernsteins restaurant recipe dressing? EEEEK! Bernstein’s Restaurant Recipe Italian Dressing: Exactly what I’ve been looking for and what brought me here 🙂 Do share please! Before they changed the quality by diluting it with water as the main ingredient – it was the hands-down absolute best dressing. We even used it as a raw food health bar I worked at in the 1970s. Bernstein’s Restaurant Recipe Italian dressing is the best dressing I’ve found. Unfortunately it is no longer in local stores, and I suspect that they were bought out and closed. Water, Soybean and/Or Canola Oil, Vinegar, Romano Cheese (Pasteurized Milk, Cheese Cultures, Salt, Enzymes), Salt, Sugar, Contains 2% Less of Garlic Powder, Barley Malt Extract*, Parmesan Cheese (Pasteurized Milk, Cheese Cultures, Salt, Enzymes), Spices, Citric Acid, Hydrolyzed Soy and Corn Protein, Potassium Sorbate and Sodium Benzoate (Preservatives), Anchovy Extract, Flavorings, Xanthan Gum, Paprika, Lactic Acid, Caramel Color, Onion Powder. *Dehydrated Contains Milk, Fish, Wheat, Soy. Please send me the recipe of what you came up with in regards to “Bernstein’s Italian Dressing”!! It is not available in my area and it makes the best chicken on the grill when marinaded with it. Yes please, George, send me your Bernstein’s Restaurant Recipe Italian recipe, too! Was put on a super restrictive diet over a year ago – have to even make ketchup from scratch! But my BRRI-style dressing recipe just doesn’t cut it & I’d love to have salad again with a dressing that tastes like my old favorite! Yes! Please post that recipe! My kids call Bernstein’s Restaurant Recipe Italian the “Magic Sauce” because it makes them love vegetables. So hard to find in stores now. If you have a good recipe for it, please share! I’m looking for MCL vinaigrette dressing. It is so good my family always said they could just drink it. I am sorry who is MCL? I don’t know. This doesn’t seem to mimic Bensteins restaurant dressing. This could be any italian dressing. I am not familiar with their dressing. Are they a brand or a restaurant? Yummy!!! Easy and very good. I don’t know any Italian that uses Apple Cider Vinegar! How would an Italian make Italian dressing? In Italy they simply dress their salads with oil and vinegar. So much healthier than how we do it in the states! A lot of people dress their salads with vinegar and oil. Have to agree with that. Cider vinegar in the US maybe, as it seems to be the norm for any US website recipe calling for vinegar, but you’d be hard pressed to find Italians using cider vinegar anywhere else. I’m 100% Italian. We used cider vinegar regularly and wine vinegar as well. In recent years, various forms of dressing have gotten popular such as the Balsamic’s, Wine Vinegar and so on. I now use a variety of vinegars. We still do use Cider Vinegar especially for the vinaigrette dressing for vegetable salads, such as green beens, Broccoli, beets and many others! Did you find this ? I”m looking for it also. What would you be looking for? Kelli, use red wine vinager instead of the cider. That gives it quite a bit of a flavor change. Also substitute 1/4 cup of the veg oil with extra virgin olive oil. Wood Ranch. Does anybody know what it is that gives it that zing? I am looking for MCL’s vinegar and oil recipe. Can you please send my way if you have it?